"My grandfather on my mother's side of the family, was from New Orleans. Through him by way of my mother and grandmother (his wife) I learned recipes for red beans and rice, jambalaya, shrimp and crawfish etoufee, gumbo, king cake, beignets and several kinds of po' boys. Usually this time of year is the only time these recipes are pulled from the depths of our flavored souls and prepared for large groups of people. But when they are made, the people are HAPPY! Hurricane Katrina messed up a lot of lives. Whole histories, families, and cultural artifacts were washed away. I'm proud to hold these types of recipes in my hand and pass them on to you so that the spirit and joy that is New Orleans lives on in all of us." The food was EXCELLENT. 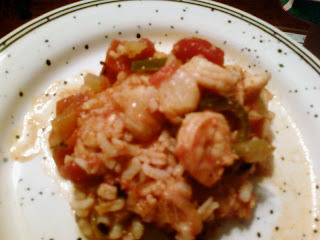 I made fish and shrimp in creole sauce, not unlike the dinner I made for my co-worker and his family last month. This time, I used canned fire-roasted tomatoes instead of tomato sauce and the sauce was not of a smooth consistancy or contrasted with a crispy texture. For texture and accompaniment I made plain white rice. The following recipe is simple and is very easy for a weeknight supper. In a pot, sauté onions, garlic, peppers, and celery in oil until onions begin to turn transclucent. In the same pot, add the chili sauce and let it brown. Stir frequently to keep sauce from burning. Once the vegetables are translucent and the sauce is a marroon brown, deglaze the pan with 8 oz of the chicken stock, scraping the bottom of the pan to mix up any browned bits, and stir until the vegetables are incorporated into the sauce. Add the tomatoes and salt to taste. Cook over low-medium heat for about 10 minutes. Add the remaining stock, check seasonings, and stir in the rice, combining thoroughly. At this time, add the fish, thyme, paprika, cayenne, hot pepper sauce. Season to taste. Add the shrimp. Cook for about 20-25 minutes, or until the rice has absorbed all the liquid and is cooked through. The rice can be cooked separately. I personally prefer it this way. *Guidelines for buying shrimp: Look for shrimp with firm white meat. The meat is starting to break down if shrimp has black spots or rings (unless it is specifically black tiger shrimp). Yellow shells indicate the shrimp was bleached. Lastly, there isn't a such thing as a "jumbo" shrimp. Shrimp are sold by the pound and this label should be used as a guideline for purchasing by the size. For example: a 51/71 shrimp means between 51 and 71 shrimp are in one pound.